I am so blessed to have some fabulous blogging friends. One of the things I love most about the blogging community is that there are so many helping hands! While I am busy moving into a brand new home, I have asked some friends to share some brand new tutorials with you. Some of these guests might be new faces that I've been dying to introduce you to; some are my oldest and dearest blogging friends. But they are all super talented! Today, please give a warm welcome to Heather from Creative Preschool Resources. I am SO excited to be guest posting here at Oopsey Daisy. Not only is Alison a fabulous crafter, she lives in the same city as me! 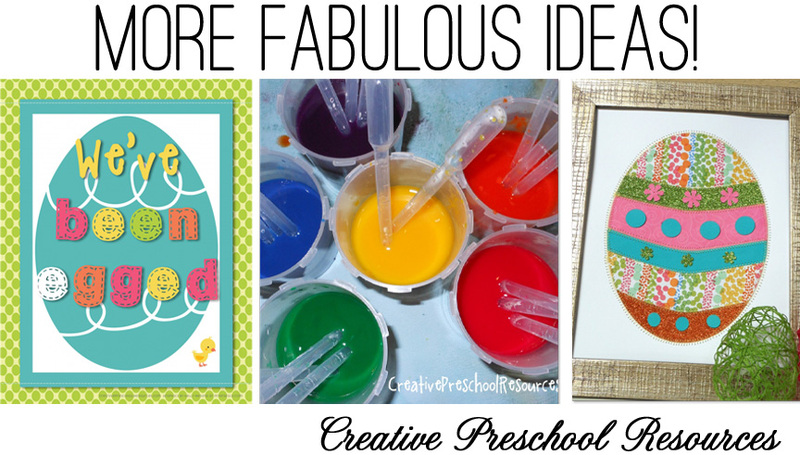 My name is Heather and I blog at Creative Preschool Resources. I am a teacher, turned Mommy, turned part time teacher and full time craft addict. At my blog you'll find lots of fun ideas for kids with grown-up crafts mixed in for fun. Check it out and follow along! Today I have a FABULOUS Easter craft that is as unique as it is cute. Check out this lovely. Yup, those are real eggs I saved from the trash. The chick in the egg makes my heart smile every time I see it. Isn't he so cute? Cheep, cheep.. This project is super easy to make. Begin with your background paper, whatever color you'd like. Using hot glue, apply the eggs. I preferred the staggered pattern, but you might like them lined up straight. It's up to you! If you ever wondered how chicks stay warm inside the egg, you'll find out. Those shells are AMAZING heat conductors so watch your fingers. Now to make your own pom pom chick. First get your favorite yellow yarn and any fork. Wrap the yarn around the fork 70-90 times depending on how full you want your pom pom. Tie it tight between the tines of the fork. Slip it off of the fork turn it over and tie it again really tight. Almost done... Now, cut each of the little loops using pointed scissors. You are now left with a scraggly looking pom pom. Simply trim it up to make it even. I think of it as giving my little chick a hair cut. Make a second pom pom and trim it to make it smaller for the chick's head. I added little eyes using "puffy" paint and a tiny triangle beak using orange felt. I finished off the project by adding cute polka dot ribbon around the edges and popping it into a frame without glass. I hope you enjoyed my Chick and Egg art and will come check out my blog, Creative Preschool Resources. ** I will do something similar to this in a kid friendly version for my preschool students. Stay tuned! Thanks for being at oopsey daisy today! Hello, and Congrats on the new house. I found your blog this weekend and fell in Love with it and so I awarded you a award over at Mommies Point of View. Please stop by and pick it up. Then let me know which none giveaway post you would like me to help you promote this week and I will. Glenda Cates recently posted..Introducing "Tag Tuesday" & "Star Bloggers"
Love your new blog look!!! Thanks Alison for sharing my tutorial! LOVE IT! Can’t wait to see how we can partner up in the future! This is amazing! I love the fork tip, pinned it! Alecia @ ChickenScratchNY recently posted..Barn Quilt Reveal!